Table Rock's beautiful village park and original commercial buildings are listed on the National Register of Historic Places. Its one-of-a-kind museum consists of seven buildings. Stop at the cemetery to see unusual pioneer graves. One mile east of town are Indian Petroglyphs located at the site of the original Table Rock, the rock for which the town of Table Rock is named. 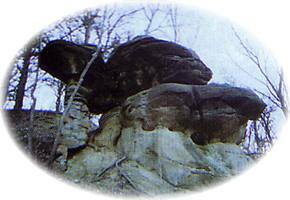 The development of Table Rock during the nineteenth and twentieth centuries is typical of communities in southeast Nebraska. During the nineteenth century, Table Rock suffered through floods, failed to win the county seat, was bolstered by the arrival of the railroad, flourished during the prosperity of the eighties, and suffered again during the depression of the nineties. The town boomed again during the early twentieth century, then experienced a disastrous fire and declined as the century progressed. In the planning of its public square, however, Table Rock is atypical. The large expanse of green space framed by unusually wide streets and surrounded by a mix of commercial and residential buildings is unique for a town its size in southeastern Nebraska. Table Rock is filled with a wealth of history. A one-of-a-kind group of seven individual museums incorporated in the downtown district capture and preserve the rich heritage of the community.